The latest regular Konsensus survey for Haberturk might not appear to throw up any voting intention surprises on first glance. AK Party holds its a clear lead (36.8%) with the CHP losing support (17.5%) and the MHP keeping firm (11.1%). The BDP trails on 3.6%, other parties were 3.5%. 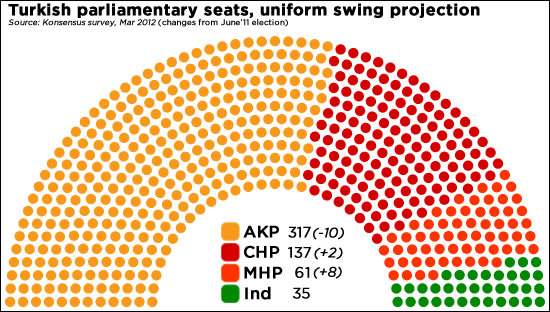 On a uniform swing projection, that would give the AK Party 317 seats (down ten from the 2011 election), the CHP 137 (up two) and the MHP 61 (up eight). That would be a healthy AK majority. The figures I quote above are based on voters who said they definitely would vote. A huge number did not support any party: 12.3% of those polled told Konsensus that they had not made their mind. A further 5.6% said they would not vote or would spoil their ballot, while 9.6% refused to answer the question. That’s 27.5%, more than a quarter of the sample, representing a huge portion of the Turkish electorate that is waiting to be convinced.